This is very much tempting..Looks so yummy..
Wow beautiful picure and the curry looks yumm. This Poriyal is with simple masala..It looks lovely..
great dish will try this for sure. Cauliflower has always been a favorite and always on the lookout for new variations. Your looks good. Like simple and new recipes, gobi curry looks yummy. 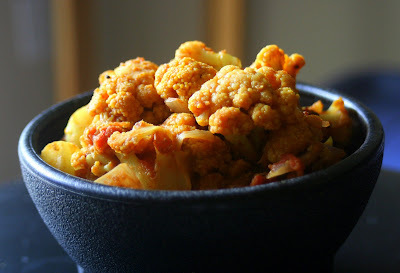 Cauliflower is my all time favourite.Your curry looks tempting.Good click. I love Cauliflower, you did a good job choosing it. Curry looks yum, love the sauce ingredients, simple and delicious! Thank you ladies for your wonderful comment. I love cauliflowers. I am trying various recipes with this wonderful vegetable and this is one big hit. wow..beautiful picture..looks like a dry item..tempting pic!! looks good - what is DHANIA? also, when using prepared pastes is that 1 TBSP of garlic and 1 TBSP ginger?